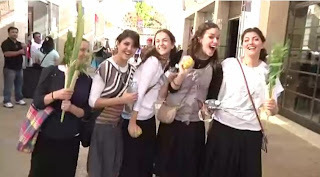 We're right in the middle of the holiday of Sukkot, and all over the world, from the first day of the holiday last Thursday, there's been a whole lot of shaking going on. Anyone who paid the price of a set of arba minim (four species - the lulav-palm branch, etrog-citron fruit, myrtle branches and willow branches) had multiple opportunities during the synagogue services to hold them in a bundle and shake them in all directions to fulfill the mitzvah that's unique to this holiday. Others have taken the shaking a step further. Bar-Cohn Productions, a fun-loving musical group in Israel created a music video filled with lots of lulav shaking set to the Beatles' song Twist and Shout. A couple of fun-loving Israeli filmmakers got into to the lulav shaking spirit and posted a one minute video that plays off of the week's most popular activity. In the video a sleepy guy awakens in the middle of the night and heads for the refrigerator. What he finds there and how he responds to the instructions on the bottle is a scene that could only happen on Sukkot. Enjoy!